You'll visit kid-friendly attractions like Sea World Theme Park and Warner Bros. Movie World. Change things up with these side-trips from Gold Coast: Byron Bay (Stand-Up Paddleboarding, Cape Byron Lighthouse, & more), Caloundra (Moffat Beach & Dicky Beach) and Brisbane (South Bank Parklands, Lone Pine Koala Sanctuary, & more). There's still lots to do: find something for the whole family at Dreamworld, enjoy the sand and surf at Norries Head, enjoy breathtaking views from SkyPoint Observation Deck, and tour the pleasant surroundings at Surfers Paradise Beach. For traveler tips and tourist information, use the Gold Coast trip itinerary planning tool . If you are flying in from Croatia, the closest major airports are Brisbane International Airport and Gold Coast Airport. 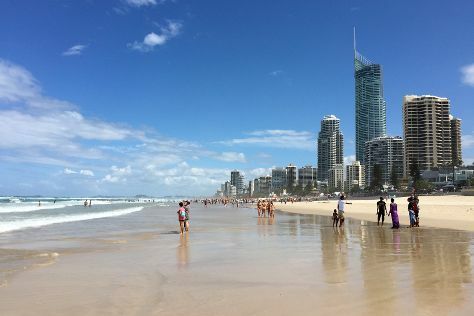 In December, daytime highs in Gold Coast are 32°C, while nighttime lows are 22°C. Wrap up your sightseeing on the 5th (Sun) early enough to travel back home.